so this is probably the last post before we head on out to SDCC!!! i can't be more excited cuz we've been itching to go back since we went the first time. it's quite the doozy of a con. if u haven't gone before, i suggest u take a trip at least once in ur life. it'll blow ur nerdy mind. =P and as excited as i am, i'm also semi-flippin out cuz i'm actually somewhat on schedule as far as stuff that i need to get done before we leave. which never happens and that makes me nervous. deep breath. guess what's on my art table today?!? 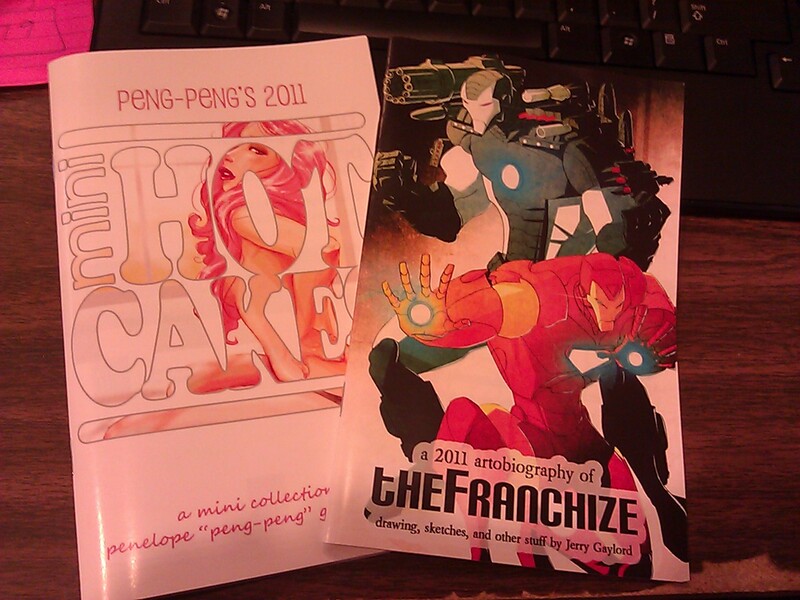 our mini artbooks!!! YAYS!! we did get them on time and i couldn't be more pleased! it's weird having my own artbook this time around. i've always felt like my art can't hold its own and need to be mixed in with my other studiomates' art (so folks don't notice its not so good). but i think i'm getting over my art-insecurities slowly. i suppose the sale of this will let me know for sure if i'm good or if people are just blowin smoke up my fanny. the other book that's got the Iron Men on it is, of course, my better half theFranchize's book. at any rate, i will be enjoying my time out at SDCC as much as i can with all the people (i'm not a fan of huge crowds). hopefully this time i won't have to throw elbows at nerds trying to get a glimpse of Megan Fox. i'll be sure to post pics when i get back. and i am on a mission to get a Kotobukiya Wonder Woman Statue. it will be mine!! till i get back, STAY CLASSY!